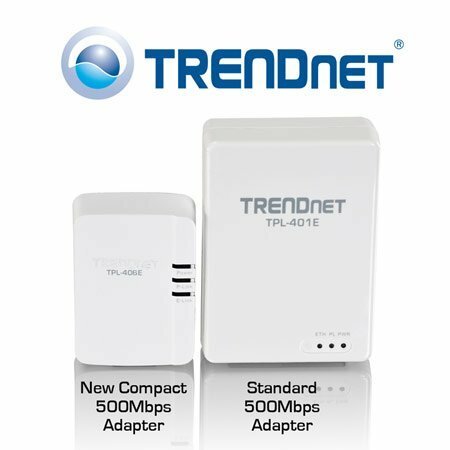 TRENDnet, a best-in-class wired and wireless networking hardware brand, announces today the availability of the 500 Mbps Compact Powerline AV Adapter Kit, model TPL-406E2K, which comes with two TPL-406E powerline adapters. These high performance 500 Mbps adapters are fifty percent smaller than the average 500 Mbps adapter. New media center devices such as Internet televisions, digital video recorders (DVRs), receivers, and game consoles are capable of streaming large HD files directly from the Internet. TRENDnet's ground breaking TPL-406E2K connects all of these devices to the Internet using existing electrical lines. Network one adapter to a router and plug the other adapter into any outlet on the same electrical system for instant high speed network access. Different TRENDnet adapters automatically connect to each other over a secure encrypted signal with no CD installation required. For additional security, press the Sync button to change existing encryption keys. Embedded power saving technology lowers power consumption by up to 70% in standby mode-resulting in measurable power savings, given that the adapters are always plugged in. "The combination of 500 Mbps speeds, a small form factor, and a reduced price point redefines the 500 Mbps Powerline category," stated Zak Wood, Director of Global Marketing. "Consumers considering Powerline solutions will notice the TPL-406E2K." TPL-406E2K Availability: Currently shipping to TRENDnet's online and retail partners.